A pair of headphones would be pretty much ordinary these days, taking into account the number of portable devices that we own which are able to play back music, with the smartphone being the primary device of choice, while some of us would make use of a tablet to get the job done. However, when it comes to choosing a pair of headphones that will suit your needs (and budget too, of course), it does get a wee bit more tricky than just waltzing into a store and dropping some coin. If you would like to stand out from the crowd, the folks over at V-MODA seem to have something up their sleeves that might just change the industry, where it will be the first 3D printed personalized wearable technology in the world. The Forg3D materials are inspired and sculpted in V-MODA’s design studio in Milano, as these 3D shields are Made in NYC and the USA. 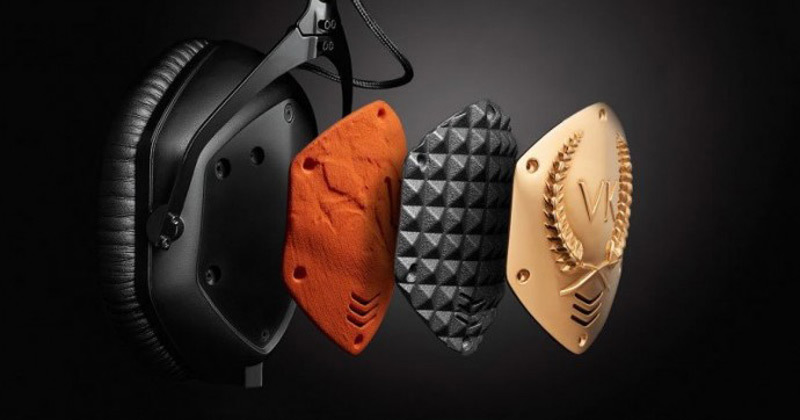 Customers can customize their headphones on the V-MODA website by choosing the base color first, before making a selection of their 3D shield material of choice, prior to settling on a design and monogram or upload their own design. Among the precious metal shields include commissioned works of art, making them the ultimate symbol of bespoke luxury. You can luxuriate yourself in sterling silver, solid 14k gold, 14k rose gold, 14k white gold or platinum to reflect your personal style. In terms of pricing, Sterling Silver will cost $430 for on-ear, $650 for over-ear shield kits; $620 with XS, $900 with Crossfade M-100, while Solid Gold will go for $4,000-5,500 for on-ear including XS, $9,000-12,800 for over-ear including Crossfade M-100; and last but not least, Platinum would be a wallet busting $12,000-16,000 for on-ear including XS, $27,000-40,000 for over-ear including Crossfade M-100.